As we read in the previous article, according to Kepler’s laws for satellites, all satellites have elliptical orbits. To be precise, that is per Kepler’s First Law. A circle is an ellipse with an eccentricity of 0. Now, based on the parameters of an ellipse, we can have a variety of shapes or paths. In this article, we will take a look at the simplest of these orbits. The geosynchronous and geostationary orbits. As you may remember from our article on the history of communication satellites, these two orbits have been a topic of interest from the beginning. Early astronomers put forth a lot of theories to explain these orbits. The main reason behind the fascination with a geostationary orbit is that it covers a large area of Earth. Only three geostationary satellites are required to cover almost all of Earth. That makes the orbit lucrative with regards to cost and simplicity. However, before we proceed, we need to understand orbit inclination. Consider the orbit of a satellite to be a disc or a plane. If this plane passes through the equator of Earth, or if it coincides with a plane that passes through the equator, the orbit has an inclination of zero degrees. The inclination angle is 0. The letter i represents the angle of inclination. Retrograde orbits – Orbits with i > 90 (Orbits where the satellite moves in the opposite direction of Earth’s rotation i.e. these satellites move from east to west.). Retrograde essentially means to move backward. In a geosynchronous orbit, the satellite has an orbital period equal to Earth’s rotation time. That is 23 hours, 56 minutes and 4 seconds. This means that a geosynchronous satellite follows Earth’s movement. For a person standing on the ground, a geosynchronous satellite will be viewable in the same region of the sky throughout the day. A geosynchronous orbit can be circular or elliptical. However, a geosynchronous satellite in an elliptical orbit will not have a constant velocity, unlike its counterpart with a circular orbit. 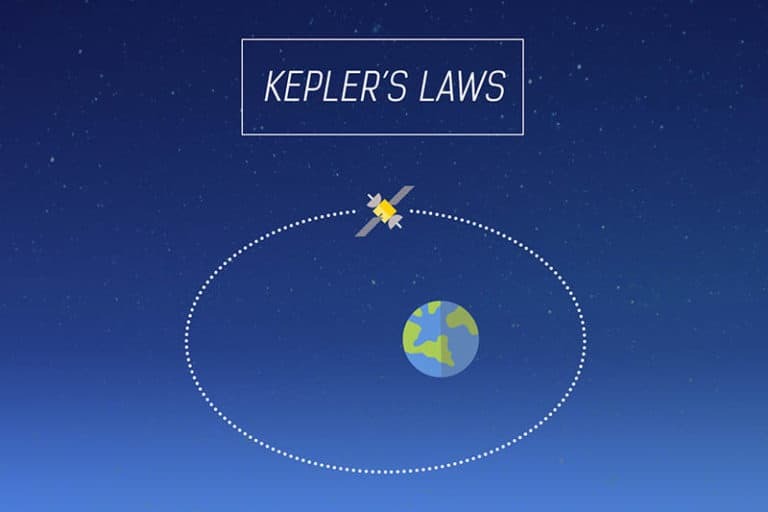 Let’s use Kepler’s third law to determine the distance that a satellite should be launched at, to have a circular geosynchronous orbit. For a truly geosynchronous circular orbit, the time period of Earth’s rotation will be equal to the orbital period (P), i.e 86400 seconds. = 42,241 km from the center of Earth or 35,786 km from the surface. Hence, for a genuinely geosynchronous orbit, a satellite must be located at an altitude of 35,786 km from Earth’s surface. A geostationary orbit is a special case of a geosynchronous orbit. A satellite in a geostationary orbit appears to be stationary to an observer on the ground. The satellite appears stationary by matching Earth’s movement, which rotates along its own axis. Its orbit inclination should be zero; its orbital plane should overlap the equator. It should be geosynchronous. Specifically, its orbital period should be equal to 23 hours, 56 minutes and 4 seconds. As we have seen from the derivation above, this implies that its altitude needs to be 35,786 km. It should have a constant latitude and longitude (to be “stationary”), that means it should be at the equator and has to be circular. As you can infer from the above requirements, only a single geostationary path can exist. Even a shift of a single degree of inclination would move the orbit away from the equatorial plane. And if it isn’t circular in shape, it won’t have the right orbital period to match Earth’s rotation. These reasons make the geostationary/Clarke orbit rather unique. As a result, it is considered to be a “limited natural resource.” You can’t just willy-nilly place a satellite in a GEO. There exist international laws and treaties that regulate satellite launches into the geostationary orbit. The International Telecommunications Union (ITU) is tasked with the job of allocating positions along this orbit. What are the disadvantages of Geosynchronous and Geostationary orbits? Communication time is a common obstacle for both the orbits. Since these orbits are located about 36000 km above Earth’s surface, a radio message takes between 0.119 to 0.139 seconds to travel between an earth station and the satellite in Clarke’s orbit. Moreover, due to the large distance, the required transmission power is high. Another disadvantage specific to geostationary satellites is that they can’t cover polar regions. Since they are situated at the equator, these satellites can’t cover regions upwards of 77 degrees latitude in either hemisphere. As we move away from the limit of a geostationary satellite’s coverage, the look-angles start decreasing. The satellite appears lower in the sky. And things like buildings and hills start becoming obstructions. This disadvantage is mitigated by geosynchronous satellites. What are the advantages of Geosynchronous and Geostationary orbits? Satellites in the geosynchronous orbits can be inclined. Hence, something like a polar geosynchronous satellite, with an inclination of 90 degrees can cover polar regions easily. Expanding on the points mentioned in this earlier post, a geostationary orbit or Clarke’s Orbit has quite a few advantages. Due to its altitude, satellites in this orbit can cover a large portion of Earth. Theoretically, only three satellites placed at an appropriate spacing in this orbit are enough to cover the entire Earth. Additionally, since satellites in Clarke’s orbit are “stationary” with respect to Earth, designing Earth stations becomes easy. Earth stations can be less expensive. Because they don’t need advanced tracking elements to track the satellite as it hurtles through the stations’ field of vision. What is the difference between Geosynchronous and Geostationary orbits? The only differences between geosynchronous and geostationary orbits are their angle of inclinations and orbit shape. Geostationary orbits have no inclination and superimpose the equator. They are always circular. In contract to geosynchronous orbits, that can be circular or elliptical and can have an inclined path. Their inclinations result in different subsatellite paths. Subsatellite paths are the ground traces of a satellite’s movement. The subsatellite path of a geosynchronous orbit and a geostationary orbit are shown below. Geosynchronous satellites have an orbital period equal to one day. Their orbits can be circular and inclined or elliptical with any inclination (including 0 degrees). For a person observing a geostationary satellite from the ground, it will appear in the same region. If the person decided to look it up at a fixed time throughout the day, it will appear at the same spot. A geostationary orbit is a special type of geosynchronous orbit with an inclination of zero degrees. It’s a circular orbit. Satellites in this orbit appear to be stationary from the viewpoint of an observer on Earth. The geostationary orbit is unique and is considered to be a “limited natural resource”.